Perth County Council will once again be under the stewardship of Warden Walter McKenzie for a second term. McKenzie was acclaimed Thursday morning in Stratford after the new council was sworn in. 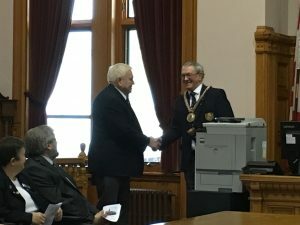 He said among many new projects for the county, the Perth County Courthouse itself needs some upgrades. “What really needs to happen is an elevator somewhere central in the building to service all the levels and provide accessibility, and you could use it for both courts,” he said. Warden McKenzie said an elevator is at the far end of the courthouse, but it doesn’t access the council chamber or superior court, making it a challenge for people with disabilities. He also said there will be more routine road work and culvert replacements done in 2019. On top of an elevator, the Stratford Courthouse campus needs other upgrades. “The registry office needs a new roof, and we’ll have to get some quotes on that. It’s been up for a number of years,” he said. The warden also said the accessibility ramp to the registry needs re-done as well, and previous quotes were quite high, so they’ll need to try and get some funding, which they’ve reapplied for. After the new council was sworn in, McKenzie addressed the gathered public, and among other things, took a moment to recognize all the local award winners this year. He said it’s a reason to celebrate. McKenzie noted the economic and tourism department’s excellence award was a Canada wide award, which is something to be very proud of and continue to build on.